It’s Advent! Yay! Happy church New Year! Over the last few years, I’ve been reading other smart bloggers talk about how their family observes Advent, which I hadn’t ever really done growing up… my family was nominally Catholic, but besides attending Mass, we didn’t really notice the liturgical year at all. The time leading up to Christmas was filled with the usual stuff, by which I mean Christmas carols, gift shopping, and not much else. It’s been really interesting to read about purposefully holding off on the Christmas celebrations until the actual 12 Days of Christmas (which START December 25), and doing OTHER things for Advent. Last year I tried to reduce my consumption of “O Holy Night” and other Christmas music before Christmas Day, but it was hard–and I think it’s because I didn’t have anything beautiful to replace it. So this year, since I’m home with the boys and a little more free time, we’re aiming to add in a few more Advent traditions. I. Am. Excited. Listening to more music specifically for Advent, instead of Christmas music. I had never heard of a Jesse tree before, so if you’re similarly clueless, here’s what I have learned: it’s like an Advent calendar, in that there is one ornament for each day in December. The first one represents Creation, and then they progress through events in the Old Testament, showing how they all lead up to the birth of Christ. Pretty cool, huh? Branch from dead tree in backyard, stuck into a pot + ornaments from FaithandFabric‘s AWESOME booklet guide. I started making the ornaments on Saturday and I’ve got five made so far. The first one gets hung up tonight. My plan is to keep making one a day, which means I’ll get each day’s ornament made before it is time to hang it on the tree, WITH a couple days of margin in case life gets crazy (because of course it will, at some point). It helps that I can handstich them while walking a fussy baby to sleep. 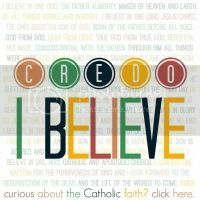 Of course, none of these things mean much if we do them just to do the “cool Catholic thing” in a spirit of showing off, like the Pharisees, instead of using them as meaningful tools to think about the Incarnation and how we are preparing our hearts to receive Jesus, both in our daily lives and as we look forward to His Second Coming. That’s something that’s been on my mind the last couple of weeks. The Mass readings have been talking not just about Christ coming to us as a baby and a Savior, but also about his coming at the end of the world, to conquer sin completely and oversee the final judgement. Lots of talking about how we do not know the day or the hour,and must stay vigilant and watchful in the night, lest He come while we are sleeping. It’s classic Advent stuff, really, but it’s not talking about Christ’s peaceful, powerful Incarnation in Bethlehem, at midnight, in the piercing cold–it’s talking about something still to come. Something that we really, actually need to prepare ourselves for, not just because it’s December and the priest is wearing purple, but because what’s coming could happen at any time. Sure, the chances of Christ returning next week are slim, but an attitude of, “Oh, not yet, I have plenty of time to go to Confession and get holy later,” are exactly what the gospels warn us about. We really don’t know the day or the hour of His return–all we know is that He will come like a thief in the night. Stay awake. Be ready. There’s no room for complacency. These are big things. Totally unknown. And that IS scary. But this Advent, I’m trying to think about it as a reason to transform my heart and mind and life, so that it feels a little less scary and a little more exciting. The King has come to us, and He will come again to reign forever. This is going to seem like a bit of a nonsequitur, but bear with me for a second. You know how when you read certain books (the best books, in my opinion), the situation for the hero seems to be getting worse and worse, and then he faces his final trial, and then somehow, gloriously, inconceivably and yet perfectly reasonably, everything works out better than you had ever expected? The peasant boy faces the dragon, wins, AND THEN FINDS OUT HE’S ALSO HEIR TO THE THRONE, which you should have recognized all along but you didn’t. That kind of ending. The kind that makes your heart feel like bursting, because it’s just so wonderful and surprising, and yet also perfectly fitting. The kind that makes you sit back in your chair for a minute to pause and smile and dream, before you’re ready to get up after reading the final pages. Well, that is the kind of story we are all really, truly living in. God is in control of the overall plot. His final coming at the end of the world will be THAT kind of ending. And all of us are minor but also essential characters in the story. This is OUR story. The King is coming. It will be AWESOME. And now it’s Advent. So let’s think about getting ready.